What happens when pigs figure out how to get access to booze? Nothing pretty. Every day during the spring, summer and fall, Shore walks out to a pig pen, located on the same property as the distillery, and dispenses a small amount of leftover mash into the pen, which is a bit alcoholic but not enough to make the pigs drunk (usually). But that was before one of her Berkshires – she’s pretty sure it was the one with the triangle-shaped patch of white on his face – scored an open bar. Tippling animals aren’t unheard of – one infamous Swedish elk got stuck in a tree after eating too many fermented apples, an Australian wild boar was seen fighting a cow after drinking three six-packs, and Pinky the beer-drinking pig is the main draw at a bar in Tasmania – but Cate Dewey, a pig expert and associate professor at the University of Guelph’s veterinary college, says this is the first and only time she has heard of a large group of pigs getting drunk at once. For decades, pigs have been used in science experiments and trials because their organs, muscles and metabolisms closely resemble those of humans. In 1977, the Associated Press reported on a group of pigs, used in alcoholism experiments, that developed a quart-a-day vodka habit, preferring screwdrivers – orange juice and distilled grain alcohol – over water or cola mixers. 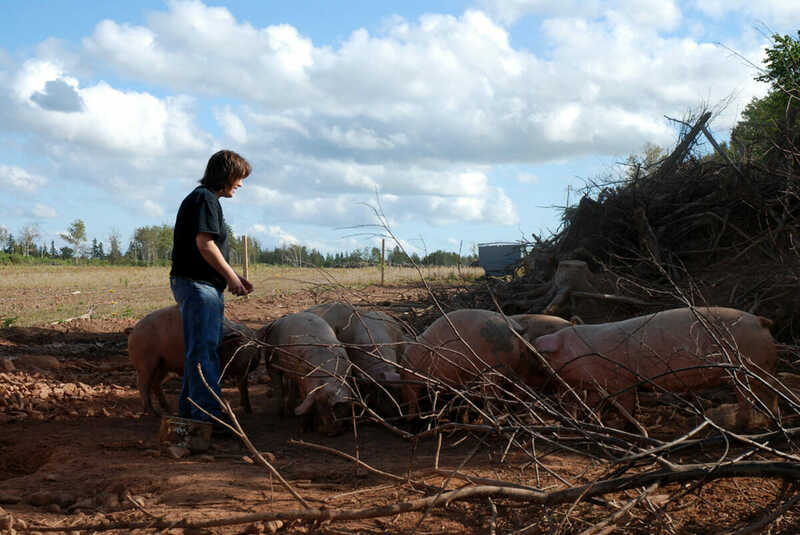 A few generations ago, says Dewey, farmers would feed beer to a nervous sow to calm her down before giving birth, and to prevent her from killing her young. But that’s exactly what Shore’s pigs did that day. It started when, earlier that day, Shore heard a strange “ding!” coming from the direction of the pig pen. A pig was trying to get at the distillery mash for an unscheduled meal. A few hours later, when she stumbled upon her hammered pigs, the whole tableau was uproariously funny for about three seconds, says Shore. One by one, the pigs passed out, and in a few hours they were all fast asleep. But, like humans, that didn’t mean they had learned their lesson. Pictured above: Julie Shore with some of the culprits.